0 Comments Published by Cedric Benetti on Tuesday, April 17, 2007 at 4/17/2007 08:55:00 PM. 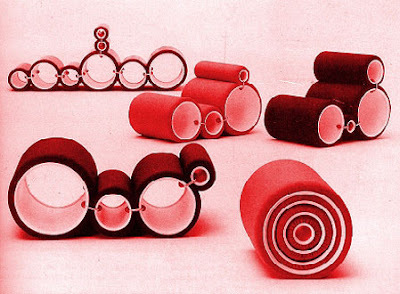 The Musée des Arts décoratifs of Paris is hosting the first international retrospective of the work of one of the most brilliant creators of his time, italian designer Joe Colombo (1930-1971) , from 29 March - 19 August 2007. So if you like futuristic ceiling televisions, pivoting walls with built-in minibar, underground ‘nuclear’ towns, come and see the show! For more on the exhibition, see this page (french only, sorry) with some pictures. A night of stalking and "extreme art gallerying"
Now with 25% true-enough Pope-flavour! Persil wäscht Pinguine weisser als weiss!